You'll love this semi-secluded gem! 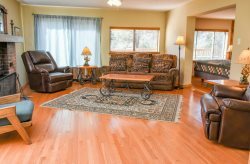 Owned by one of the owners of La Junta Guest Lodge, this great cabin has been recently renovated and has almost all new furniture and appliances, and now has a brand new hot tub! 3 bedrooms, 2 baths, large master suite. Close to the ski area, yet 10 minutes from the heart of Ruidoso! Get away from it all in this fabulous private retreat. Rent it by itself, or expand your large group's accommodations at La Junta Guest Lodge, only a stone's throw away. Sleeps 8 with queen sleeper sofa. Enjoy the brand new, private, hot tub on the main deck.